We finish our Lenten talks on prayer with the religious orders this Saturday, 8 April. 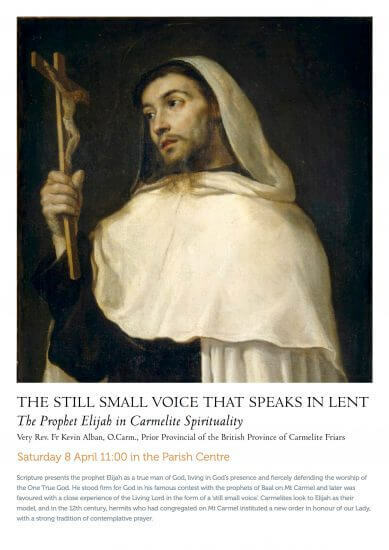 Fr Kevin Alban, O.Carm., the Prior Provincial of the British Province of Carmelite Friars will speak on The Still Small Voice that Speaks in Lent: The Prophet Elijah in Carmelite Spirituality. Scripture presents the prophet Elijah as a true man of God, living in God’s presence and fiercely defending the worship of the One True God. He stood firm for God in his famous contest with the prophets of Baal on Mount Carmel and later was favoured with a close experience of the Living Lord in the form of a ‘still small voice’. Carmelites look to Elijah as their model, and in the 12th century, hermits who had congregated on Mount Carmel instituted a new order in honour of our Lady, with a strong tradition of contemplative prayer. 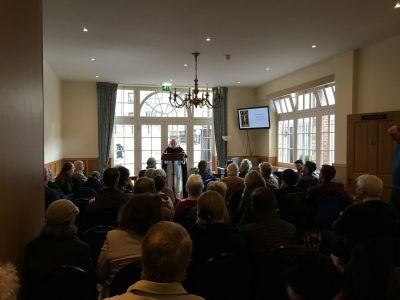 Talks take place on Saturdays at 11:00 in the Oratory parish centre and are open to the public. Tea and coffee available before from 10:30.